I am a Black Belt. Not the Bruce Lee, or Tai Kwan Do kind, but the Lean Six Sigma type. If you’re confused, it’s probably because you haven’t yet heard of the practice of Lean Thinking. However, you probably experience some form of it almost daily. For example, if you’ve ever bought a product from Amazon, General Electric, or Toyota, then Lean Thinking is at the core of the products they make, and the customer experience you have with them. “Whoa, wait a minute, I’ve heard this before,” you say. That’s just corporate speak for ‘headcount reduction’ and ‘budget cuts.’ Unfortunately, that’s usually the first reaction, but it’s a huge misconception. In truth, Lean Thinking is a philosophical change in how you perceive customer value and organizational waste. It provides a set of tools and techniques for getting to the core value proposition of your business, why your clients really pay you for your product or service, and it helps you eliminate and improve those elements that provide little or no value to them. And this really leads us to the answer to the second question, why you should care. You should care about lean because you care about your clients – and your stakeholders. You care about your business and you want to improve it, keep it growing, and…oh, yes, make it more profitable. So let me give you a tangible example of Lean Thinking as it applies to the profession of financial planning. Ask yourself, what is the real reason your clients pay you? What is your true value proposition? Is it your knowledge, expertise, tenure, geographic location, the team, you efficient business process (or lack thereof), your ethical conduct….? To a certain extent, it may have something to do with all of those factors, and more. The point is, until you really know for sure what your clients value, and quantify those things, you are flying blind. How can you provide ‘value’ to them if you have no idea what it is they value, and more importantly, how much they are willing to pay for each ‘thing’ you provide? Ok, now for the flip side: where is the waste in your business? By waste, I mean things that your clients don’t value; i.e. what would they not pay for if they didn’t have to. For example, how much do your clients value the pretty binder their plan comes in? Would they instead prefer their plan be provided in electronic format? How long do they have to wait to get on the calendar for an appointment? 2 days, 2 weeks, or 2 months? Do they appreciate someone picking up the phone on the first ring, or are they ok leaving messages multiple times? In a perfect world, if a financial planning business were acting as a truly Lean Thinking organization, they would be constantly working to understand and define client value, and at the same time, seeking to identify and eliminate waste. And by constantly, I mean these evaluations are built into their ongoing business processes. It’s part of how they do business, not just a once a year planning exercise. In doing so, they would be making their clients more satisfied, reducing or eliminating the unnecessary, thus lowering business costs and improving profitability. Hmmm, happier clients and lower costs…seems like a winning formula to me! I think these concepts are one of the reasons why the idea of a ‘robo-advisor’ has so many businesses freaked out. 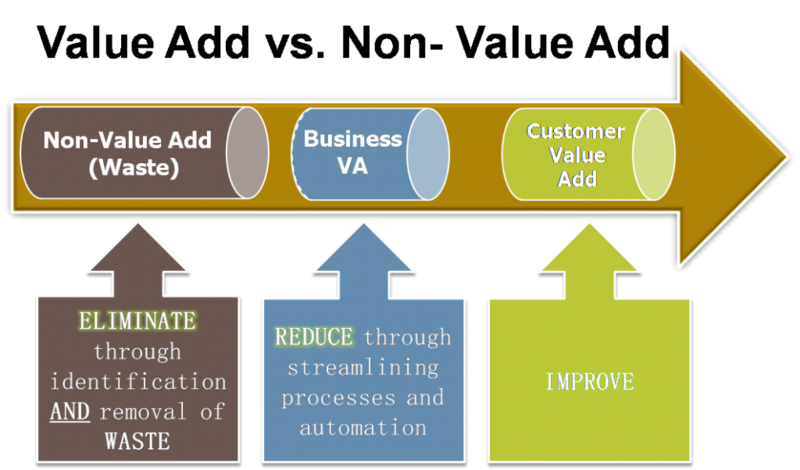 If you think about it, determining client value and eliminating waste is exactly what these robo-advisor firms are attempting to achieve. (I’ll leave it to others to decide how successful they are.) That is the reason they can charge 25-50 basis points for services that traditional advisory firms charge much more to provide. They’ve cut out services that many clients may not value and are unwilling to pay for. For many traditional planning businesses, the advisor has a sense for what his or her clients truly value. However, they haven’t focused on actually quantifying what is valued. Eliminating waste has traditionally meant cutting office expenses or overhead, not doing a deep dive into business processes or services the clients really don’t care much about. It’s often a process of resource reallocation, rather than reduction. So now you know what Lean is. For our history buffs, Lean Thinking has its roots in Toyota’s original business philosophy. 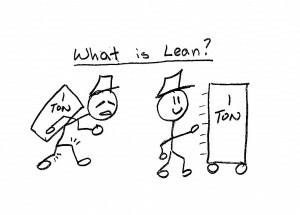 Many will say that Lean is only for manufacturing companies, where you have a physical product. However, if you read about Toyota, you will find it isn’t about the product they make (cars). This is about how they run their business, and it undoubtedly represents a significant philosophical change that can apply to any industry and any business, no matter the product or service. Just remember, Toyota started as a small, broke, scrappy startup that has grown to become the largest auto company in the world. Lean is one of the main reasons their business has succeeded and it has been adopted by healthcare, government, non-profit and other types of businesses. Obviously this topic goes much deeper than what I can summarize here. To close, I would argue that, given the significant changes happening right now, it is more critical than ever for those of us in the financial planning profession to become Lean Thinkers and hire Lean Thinkers. It is time for us to Kaizen! If you seeking Lean solutions, don’t hesitate to click HERE to schedule a one-time Boost Call or HERE to inquire into our business operations strategy services. Landon Tymochko is a Registered Representative and Investment Adviser Representative with/and offers securities and advisory services through Commonwealth Financial Network, Member FINRA/SIPC, a Registered Investment Adviser. Fixed insurance products and services offered by Leslie Roper Day & Associates or CES Insurance Agency.